TODDLER STORYTIME IS BACK IN SESSION!!!! A Flannel Friday dropout NO MORE!! I haven’t had a #FF to post in a zillion years! I can’t promise to post #FFs as regularly as I have in the past, but I have one this week. Anyway, here’s a prop story for a brilliant little picture book: Early Bird, by Toni Yuly. This is a perfect book for baby and toddler storytime. The illustrations are bold. The language is simple. The concepts are concrete. And yet, in spite of all this simplicity–or perhaps because of all this simplicity–the story delivers a boat-load of drama and character development. This makes it an ideal choice for a prop story. If you haven’t read this picture book yet, YOU MUST!! Here’s a summary…SPOILER ALERT: Early Bird features a surprise ending, so if you want to experience this twist in real time, read this post after you read the book. However, the story is told in less than 100 words. If you’re reading this, you are a grownup, so I’m guessing you don’t mind the spoilers. But I digress… I am paraphrasing. Early bird wakes up. She stands up as tall as she can. Then she gets going. As she walks, she passes grass, flowers, a spider web, rounds a corner, enters the garden. In the garden she meets a worm. She picks up the worm, lays it on a big juicy strawberry, and then… She and the worm share the strawberry for breakfast. The last page shows early bird and worm singing a morning song. here’s the whole kit & kaboodle. Here’s a close up of the finger puppet, worm, and strawberry. They are a little hard to make out in the 1st photo. First we read the book aloud. Then we did a few different activities. 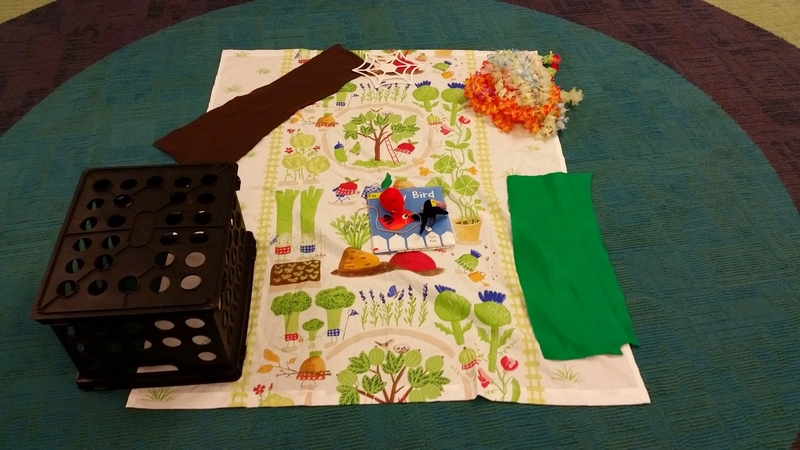 Then I pulled all this junk out, and we retold the story using the props. Easy peasy lemon squeezy. Ms Kelly at the Library is hosting the #FFRU! Thanks Kelly! Don’t forget to check out the pinterest for lots of flannely goodness. I am so glad you liked it! Early Bird is a rare gem: a perfect picture book for toddler book. The language, illustrations, and plotting hit the nail right on the head at that 2-3.5yo. age range. Please, Please, Please write more books!